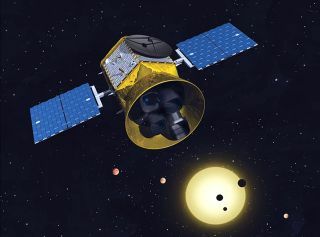 An artist's illustration of NASA's Transiting Exoplanet Survey Satellite, which is scheduled to launch on April 16, 2018. NASA's next exoplanet-hunting spacecraft will take to the skies one week from today (April 9), if all goes according to plan. But Kepler's finds are mostly faraway worlds at least several hundred light-years from Earth. TESS will aim to find planets close enough to be investigated in depth by other instruments — especially NASA's James Webb Space Telescope, the $8.8 billion behemoth scheduled to launch in 2020. TESS will do its work from a unique vantage point: a highly elliptical orbit that no other spacecraft has ever occupied, mission officials have said. After launch, TESS will gradually expand its orbit until it flies close enough to the moon to receive a gravitational assist, according to a new NASA video. "This slingshot will move it into a stable orbit that is tipped at about 40 degrees from the moon's orbital plane," the video's narrator explains. TESS will end up zipping around our planet once every 13.7 days. "TESS orbits Earth in exactly half the time it takes the moon to orbit once," the narrator says. "This feature helps stabilize the spacecraft's orbit against tugs from the moon's gravity." TESS will spend at least two years in this orbit. The farthest point, or apogee, will be 232,000 miles (373,000 kilometers) from Earth, allowing the spacecraft to survey part of the sky without interference from the moon or our planet. The closest point in the orbit, or perigee, will be 67,000 miles (108,000 km), which is about three times the altitude of geosynchronous satellites. During every close encounter with Earth, TESS will beam back information it collected from its previous round of astronomical observations. TESS will spend its first year observing the celestial Southern Hemisphere, swinging between different locations in the sky every 27 days so that it always points away from the sun. Then, TESS will observe the entire Northern Hemisphere in 27-day slices during the spacecraft's second year. TESS is led by principal investigator George Ricker, an astrophysicist at the Massachusetts Institute of Technology. The mission is managed by NASA's Goddard Space Flight Center in Greenbelt, Maryland.